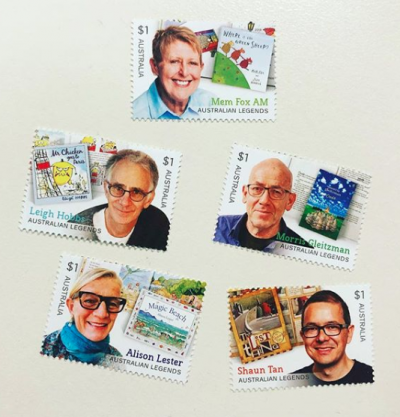 Australia Post is honouring five children’s authors on its ‘Australian legends of children’s literature’ postage stamp series, as part of its 2019 Legends Awards. Shaun Tan (The Lost Thing, Lothian). In its 23rd year, the Australia Post Legends Award celebrates living Australians who have made a unique contribution to the nation through their field of endeavour. Fiction authors were featured in an ‘Australian legends’ series in 2010, which included Peter Carey, Bryce Courtenay, Thomas Keneally, David Malouf, Colleen McCullough and Tim Winton, and cookbook authors were featured in 2014, including Margaret Fulton, Maggie Beer, Stephanie Alexander, Neil Perry and Kylie Kwong. On the first day of issue, the authors were presented with a 24-carat-gold replica of the stamp on which they are represented. The 2019 Australia Post Legends will also be honoured at official Australia Day council events hosted in Melbourne and Sydney. Australia Post is selling various postage products related to the series, as well as a range of books by the authors.